One of my main considerations in choosing a university years ago was location. Sure I wanted to go to a school that was a little farther away from home for a change, but upon seeing just how bad the pollution in Manila City was, I decided that it wasn’t for me. So hello, UP Diliman! 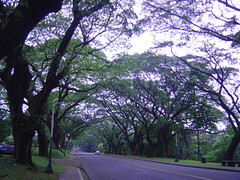 Quezon City’s hardly the cleanest city in Metro Manila, but at least UP Diliman has trees. Lots of them! It’s nice to just be surrounded by green, especially when attending classes the day after an all-nighter. Instant eye strain remedy! I miss UP so much! Great picture. Wish we had streets like that in Honolulu!